The following text was contributed by the Government of Denmark. The world is changing and this calls for a continuous effort to renew and improve Danish society. A prerequisite for this is comprehensive and innovative reforms developed in partnerships that remove traditional boundaries. Broad partnerships are a vital source of inspiration with regard to modernising the public sector, and Denmark has a long tradition for openness, dialogue and cooperation. In this light, it is hardly surprising that many individual public authorities are taking a strong interest in the potentials of open government. An example of an open government activity which truly placed collaboration at its centre was the 'Open Gov Camp 2012'. At the Open Gov Camp, citizens, businesses, NGOs, and public authorities worked together to develop new ideas, to learn from each other, and to come up with cool solutions to tough challenges. The camp consisted of a series of workshops, each taking on current challenges and issues and trying to find new solutions. The individual workshops at the camp were collaboratively organised by public authorities, NGOs, citizens and businesses. 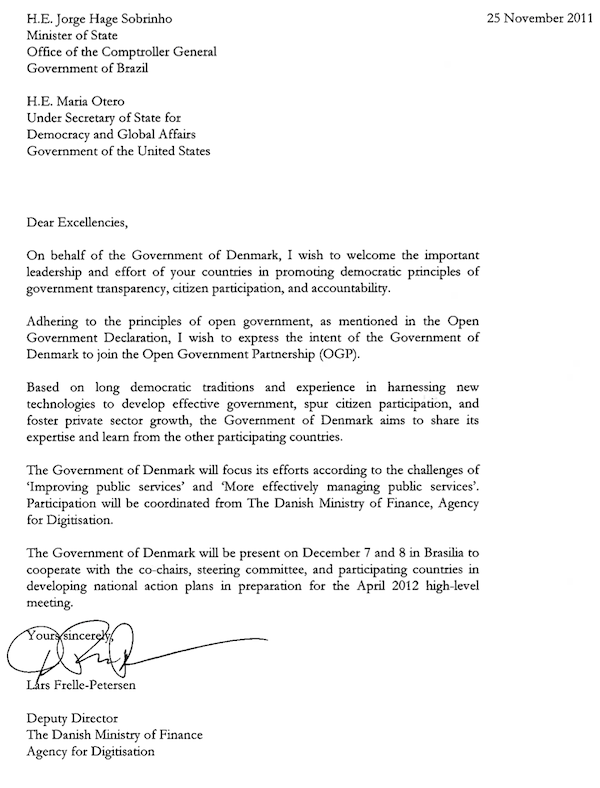 In conjunction with OPG Summit 2013 in London, Denmark launches its second national action plan on open government. The plan places a strong emphasis on collaboration, volunteerism, local democracy and participation, and the harnessing of new technologies to strengthen transparency, growth and quality of life, and it speaks about a new approach to the role of the public sector which involves and necessitates an active involvement of citizens, businesses, and civil society in general. Just like the first Danish Action Plan for OGP (2012), this new action plan draws on input and ideas from a public consultation.